The US Embassy Move to Jerusalem vs. the "Peace Process"
By recognizing Jerusalem as the capital of Israel, President Trump brought his administration into compliance with the 1995 Jerusalem Embassy Act. 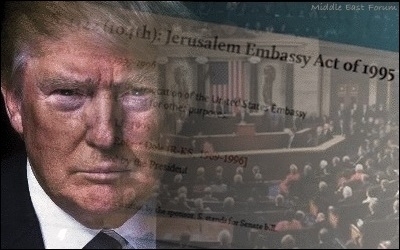 On December 6, US President Donald Trump fulfilled a promise that was made by Congress on November 28, 1995 in its Jerusalem Embassy Act -- to recognize Jerusalem as the capital of the State of Israel and to mark this by moving the U.S. Embassy from Tel Aviv to the ancient city. That move, according to the Act itself, was to "be established in Jerusalem no later than May 31, 1999." Trump's declaration that the US will now implement the Act has been a historical démarche. So why has it taken so long to act on this agreement? For more than two decades, this clear expression of the will of Congress had, in effect, been held in abeyance following an amendment (section 7) that introduced a waiver that allowed presidents to "suspend the limitation set forth in section 3(b) for a period of six months if he determines and reports to Congress in advance that such suspension if necessary to protect the national security interests of the United States." Since then, every president who followed (including Trump, six months earlier) exercised this waiver. though both the Clinton Administration and Israeli government 'support the move to Jerusalem in principle, they would prefer to see the peace process more stabilized before confronting the explosive issue of Jerusalem'. 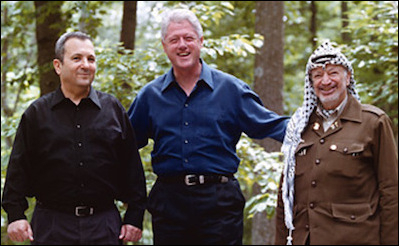 Clinton's naïve, but at the time understandable, belief that movement was being made towards Israeli-Palestinian peace was only shattered five years later when Palestinian Chairman Yasser Arafat walked away from a major round of agreements at Camp David and some months later started the Second Intifada (the so-called al-Aqsa Intifada) that lasted from 2000 to 2005, and led to the deaths of thousands on both sides. So much for that peace process. "Our Palestinian neighbors have not yet internalized the fact that in order to achieve peace, each side has to give up some of their dreams," said then-Israeli Prime Minister Ehud Barak (left) after the failure of the 2000 Camp David talks. On his return to Israel after the failure at Camp David Israeli Prime Minister Ehud Barak, wisely commented: "We did not succeed because our Palestinian neighbors have not yet internalized the fact that in order to achieve peace, each side has to give up some of their dreams; to give, not only to demand." Since then, there have been numerous attempts to arrive at a peace settlement between Israel and the Palestinians. Not even the most promising of these has succeeded, and that lack of success must be put down flatly to the refusal of the Palestinian leadership to accept a single proposal, or even proposing a counter-offer. Everyone who has ever been involved in setting up a deal in business, in law, in a religious or political dispute is aware that nothing can be achieved if there is no one on the other side willing to play the game and make compromises, even if a few compromises might lead to their benefit. Regrettably, Palestinian Authority (PA) President Mahmoud Abbas, currently in the twelfth year of his four-year term, is doubtless correctly convinced that any deal he might sign would propel him to be "drinking tea" with assassinated Egyptian President Anwar Sadat, the first Arab leader to sign a peace agreement with Israel. The Palestinians do not want peace. They want victory. The simple reason for this recalcitrance in the Israel-Palestinian dispute is that the Palestinians do not want peace. They want victory, a victory that will lead to the elimination of Israel and the expulsion of the Jews. A victory would also end Jewish immigration. To say the Palestinians and their allies do not want peace is not based on a contrarian imagination. When eight Arab states met in Khartoum shortly after the 1967 Six-Day War, they passed a resolution that included "three Nos": No peace with Israel, No recognition of Israel and No negotiations of Israel." Although Egypt and Jordan subsequently did make peace treaties with the Jewish state, the spirit of Khartoum among the Palestinians is, after decades of further anti-Israel indoctrination, stronger than ever. When the Palestinians (and their supporters in the West) chant "Palestine will be free from the river to the sea," they could not be clearer: it means a Palestinian state will stretch from the Mediterranean to the River Jordan, where it will sit alongside (or merge with) the long-standing Palestinian state of Jordan. 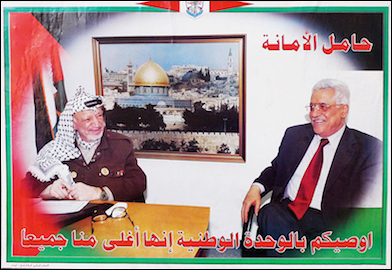 Like his predecessor Yasser Arafat (left), PA President Mahmoud Abbas (right) fears he will be "drinking tea" with assassinated Egyptian President Anwar Sadat if he signs a peace treaty with Israel. Declarations of the Palestinian aspiration to replace Israel with a triumphant Arab state (see any map of "Palestine") are not confined to protesters in the West Bank or on US and British university campuses. They are deeply embedded within the four Palestinian charters: the twin religious charters of Hamas (1988 and 2017) and the two quasi-secular charters of the Palestinian Liberation Authority (1964 and 1968). The current Hamas charter, for example, rejects "the Zionist state" (Article 18), is explicit in encouraging armed resistance through jihad (Article 21), and in Article 19 insists on total reclamation of what they consider Palestinian land: "We do not leave any part of the Palestinian's land, under any circumstances, conditions or pressure, as long as the occupation remains. Hamas refuses any alternative which is not the whole liberation of Palestine, from the river to the sea." How exactly is one to believe that a peace process is even on the table given the expressed intentions of Hamas and the PLO in a context of repeated Palestinian violence against Israel: three wars launched by Hamas from Gaza, two major intifadas and terrorism conducted from the West Bank and inside Israel. Every time there is a prospect for peace, Palestinians react with violence if they cannot get everything they want. Every time there is a prospect of peace on the horizon, the Palestinians react with tantrums, anger and outright violence if they cannot get everything they want, which is 100%. They are probably unique in this. In 1922, the Irish Free State (now the Republic of Ireland), despite a bloody Civil War, entered into a peace treaty with the United Kingdom, and agreed to give up its northern counties. If Ireland is ever to be reunited, that shift will take place by a democratic process, not violence. But the Palestinians seem wedded to violence. In both Gaza and the West Bank, the entire culture is devoted to hatred of Jews, admiration for suicidal terrorism, financial benefits to murderers and their families, anti-Semitic school textbooks, maps that portray a Palestinian state that eliminates Israel, mosque sermons that call for armed resistance, and political speeches that do the same. Nowhere is there the least effort to pursue peace. There is no sign of a genuine peace process on the horizon any time soon. Last year, four Palestinians who visited Israelis along with other Palestinians to wish them well for the Sukkot holiday as part of a peace event, were arrested by the Palestinian Authority. All attempts at normalization between Palestinians and Israelis or with other Arab states and Israel are routinely dismissed as treachery, a position that endangers the lives of any Palestinian who seeks for peace. The most violent confrontations occurred in [the West Bank towns of] Ramallah, Bethlehem and Hebron, where Israeli security forces fired teargas and plastic-coated rounds as hundreds of protesters threw stones and set alight barricades. Hamas leader Ismail Haniyeh has incited a fresh intifada in response to what he calls Donald Trump's "declaration of war." Perhaps in response to that, rockets have been fired from Gaza into Israel, forcing the Israeli Defence Force to declare a red alert in Hof Ashkelon. In Egypt, television host Hisham Abdallah has already called on Palestinians to set Jerusalem on fire. According to Patrick Wintour in the Guardian, there have been protests in Istanbul, a Tunisian labour leader has, like Haniyeh, condemned the US decision as a declaration of war, and, more widely, the Organisation for Islamic Cooperation (OIC) met in Istanbul on December 13 in a special session to co-ordinate a response. It is an only too familiar story. Once again, the Palestinian response is not to sit down and talk about the changes this act of recognition would bring about. Meanwhile, Western leaders, including religious figures such as the Pope, are enchanted with the fantasy that a peace process exists and forever chant the mantra that nothing must be done to interrupt it. President Trump's decision to recognize Jerusalem as the capital of Israel is the first time any world leader has stood up to the threats of anger and violence. His decision has been almost universally celebrated by Jews around the world, and by Christians and others who care for both Israel and peace; his announcement is likely to go down in history as a game-changing move that will have long-lasting consequences for the good, however much it is now being derided by Israel's enemies in the Islamic world and the West. 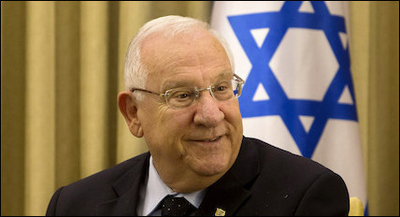 Israeli President Reuven Rivlin: "Jerusalem is not, and never will be, an obstacle to peace for those who want peace." "The Palestinian claim to Jerusalem is of no consequence in the world of modern politics. Jerusalem has never served as an Arab or Islamic capital. Muslim religious claims do not even match scriptural or historical fact," as the Pakistani historian Mobarak Haidar explained the day after Trump's speech. Denis MacEoin, a senior editor at Middle East Quarterly, is a distinguished senior fellow at the Gatestone Institute.